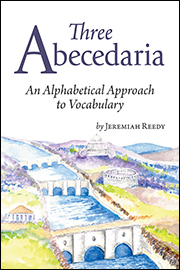 Three Abecedaria aims to equip readers to become logophiles, or lovers of words, by introducing them to the world of etymology. Reedy shares his own “logophilia” with readers as he leads them meandering through the world of words. Most abecedaria are for small children—"A is for apple; B is for ball; C is for cat," etc. These abecedaria are for high school students, especially juniors and seniors, who may want to increase their vocabularies—"A is for Apocalypticism; B is for Benediction; C is for Cogito ergo sum," etc. The abecedaria are organized by language: Words Derived from Greek, Words Derived from Latin, and Words Derived from Latin Phrases. Each abecedarium highlights English words derived from Latin or Greek, provides etymological explanations, and explores related English derivatives from the same roots.